I'd hoped to write this sooner, but what can I say...I've been hibernating and recovering rather than writing a blog post. But alas, here it is. Monday, September 20th we went to Overlake for an ultrasound to make sure that the womb was still a healthy environment for our baby to remain in. The tech who performed the ultrasound had said that our babies femur bones were so long they were "off the charts". Her head was measuring big too. She also came up with a 8lb 14oz guess for size... So a big and tall baby was the prognosis - that didn't sound fun. Then the doctor came in, took a look, adjusted some measurements and guessed that our baby was somewhere between 7 and 8lbs. I liked the sound of that much better! Since everything showed up healthy on the ultrasound it was determined safe to continue pregnancy into the 42nd week (if I was really that far along). So the following day we went to the birth center for a 41.5 week appointment and had my membranes stripped again (they also did this the previous Thursday at my 41 week appointment). I was hopeful this time it would help start labor. 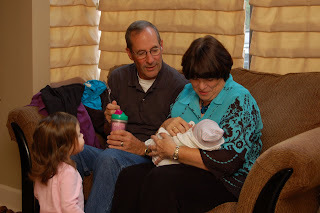 That evening I started noticing contractions as we sat down to dinner around 7pm. I'd had contractions like this before so I tried not to pay attention to them this time. They were close together, but not painful at that point. We continued on with our night...put Hailey to bed and then settled into bed for some TV time. We started timing contractions at midnight and after an hour and a half of timing them, my contractions were all between 3-6 minutes apart and a minute long. Since we were preparing for a quick delivery, my midwife had said to call if contractions were 7 minutes apart or less...so at 1:30 we paged our midwife Nicole. She called back and said that another couple was going to be meeting her at the birth center at 2:30am so she told us we could arrive at the same time and labor there (at this point I was really confused as to how early/late to go to the birth center - my last experience consisted of arriving and then promptly pushing Hailey out). My mom came over to get Hailey and we gathered up our bags and headed out the door. We got to the birth center around 2:30am and found our birth suite to be a calming oasis. It was like a hotel but with candles burning and music playing! 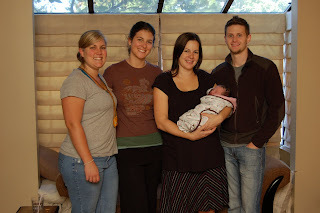 We chose a different birth suite than we had with Hailey. I wanted new memories of this birth and didn't want to be expecting things to go as they did for Hailey's birth. 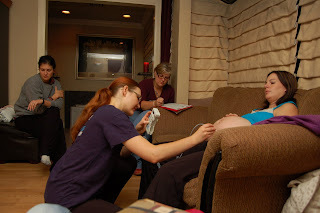 Since there were 2 of us in labor at the same time, we talked with the team about how the resources would be used (an extra student and midwife were brought in to provide support in case we were both delivering babies at the same time). 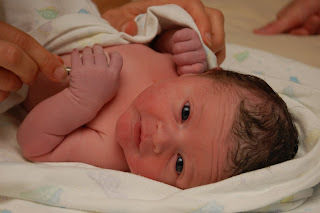 The other couple had met with the other midwife more times than we had, so it was determined that the other midwife would attend the other birth if needed and I would have my normal midwife. So on we went. They checked vitals and at 3am they told us to try and sleep for a bit if we could. The plan was to break my water in about 3 hours and at that point it sounded like a good plan. Pete and I laid down and my contractions seemed to space themselves further apart (though they slowly grew in intensity). I began to feel a bit of stress and worry "oh no, did we come too soon? what if this isn't really labor?!! I'm supposed to sleep through this??". Pete was able to sleep a bit. I was not. I was worried and also wondering why I should try to sleep if it put my labor at ease - the opposite of what I wanted to have happen. Shortly before 6am my contractions got to be quite uncomfortable. Laying down wasn't comfortable so I got up and started pacing around the room between contractions and was feeling much better that I was obviously progressing. I opened the door to find my birth team...only to find the place to be empty. I heard a baby down the hall cry and realized that the other baby had just been born. The midwives eventually walked out of that room and said "one down, one to go!". They told me to eat some food while they caught their breath. I ate a granola bar and had started on a banana (yuck!) when they came in to attend to me. At this point, my contractions were really getting strong. I was in active labor - no doubt about it. At 7:15am I was at 7cm and they broke my water. You could say a state of panic swept over me. My body responded and I suddenly went from hard contractions to "oh my gosh I don't know what to do with myself it hurts so bad" contractions. I wouldn't say that these contractions were any different than what I had with Hailey's birth - but through Hailey's 7 hours of labor I was able to naturally progress and apply the pain management/coping techniques I'd learned in various classes I'd taken. I wasn't ready for the change of pace that breaking my water brought on and in looking back, I wish we hadn't gone that route. When I labored with Hailey I didn't use Pete at all, I was in a zone - a spaced out and focused zone that didn't require anything but a dark quiet room. This time, I clung to Pete as contraction after contraction hit me. They put hot water in the tub and I got in. I was holding Jacki's hand (student midwife) and squeezing like crazy while Pete ran to get a cold washcloth to put on my forehead and also brought some water for me. I felt like pushing, and they said I could. So I did. But I didn't know how close the baby was to coming out...so I didn't want to waste my resources pushing. I had crazy thoughts and was fighting the pain instead of working through it. I hit a point where in my head I called myself stupid for trying to do this naturally again. I was screaming in my head "cut the baby out, just get it out of me! This is the stupidest thing I've ever done, why am I here?!". Mentally I wasn't doing well. I had a moment like this during Hailey's birth, but this time it seemed to last longer and I was really beating myself up. As I was having crazy thoughts about the whole situation I managed to stop myself and say "how did you do it last time?". This was huge. I realized that I needed to change my state of mind. I finally muttered out loud "I can do this!" and everyone told me back "you CAN do this!!" and so at some point after that I took a deep breath and with all my might and determination I pushed. I really wanted to get her out and end the crazy business. And what do you know...with that big push - out came her head. Until this point, no one had even seen her head so they were quite surprised to see it there so suddenly. She was born at 7:57am (42 minutes after breaking my water). Pete caught her and brought her to my chest. She let out a little cry and then was quiet and content. We finally got to meet our little girl! I held her for a while in the tub and admired her. 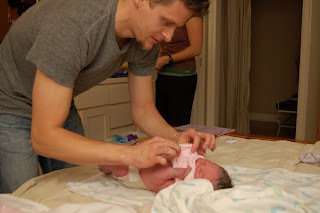 Pete cut the cord and then held her skin to skin while I got cleaned up and moved over to the bed. 20 minutes after she was born she nursed and proved to be good at it! At our request, my parents brought Hailey to the birth center to meet her little sister. Pete and I ate the breakfast my parents brought us while our little girl had a newborn exam.